Ernst Ludwig, destined to be the last Grand Duke of Hesse und bei Rhein, was born in November of 1868. He was one of seven children born to the future Grand Duke Ludwig IV and Princess Alice of Great Britain and Ireland, second daughter of Queen Victoria and Prince Albert, the Prince Consort. He was preceded by three sisters-Victoria, born in 1863, Ella, born in 1864, and Irene, born in 1866-and followed by a younger brother, Friedrich, in 1870, and two sisters, Alix, born in 1872, and Marie, born in 1874. Called Ernie within the family, he grew up in his father's Neues Palais in Darmstadt, a large, Italianate structure where the children were raised according to English standards and watched over by an English nanny, Mrs. Mary Anne Orchard. Ernie was five when his brother Friedrich, or "Frittie" as his family called him, died. The two brothers had been playing a game when Frittie fell through an unlatched window, tumbling to a stone terrace some twenty feet below. At first it seemed that Frittie was only shaken, but he suffered from hemophilia and, later that day, he lapsed into unconsciousness and died. Ernie, who had always been so sensitive to Frittie's pain, and had been moved to tears watching his terrible suffering, was inconsolable. "I don't like people to die alone," he once cried to Mrs. Orchard. "We must we must all die together!" And, to his mother, he said, "I dreamt that I was dead and was gone up to Heaven, and there I asked God to let me have Frittie again and he came to me and took my hand." Frittie was interred in the family Mausoleum in the Rosenhhe, a leafy Darmstadt park, beneath a tiny marble effigy. The grave soon became a place of regular pilgrimage for the family. This morbid influence was hard on the young Ernie, who may have blamed himself, in part, for his little brother's death, and he seems to have become obsessed with thoughts of dying alone. Virtually repeating sentiments already expressed to Mrs. Orchard, Ernie exclaimed to his mother one day, "When I die, you must die too, and all the others. Why can't we all die together? I don't want to die alone, like Frittie." Princess Alice, in the deepest of Victorian mourning, found such sentiments touching, not recognizing the effect excessive grief had on her remaining son. Only five years later, tragedy again struck the Hessian family, when the eldest daughter, Victoria, fell ill with diphtheria in November 1878. Within days, all of the Hessian children-as well as the Grand Duke-were sick, except for Elizabeth, who was sent from the palace to stay with relatives. Princess Alice nursed the patients herself but, on November 15, the youngest daughter Marie-known as May-died. Alice kept the news from her family for several weeks. Then, one night, Ernie-who had doted on May-asked after her, and his mother broke down, confessing her death; in an attempt to comfort her son, she bent over and kissed him. Within a week, Princess Alice fell sick and, on December 14, the seventeenth anniversary of her father's death, she died at the age of thirty-five. In his condolence address to the British House of Lords after her death, Prime Minister Benjamin Disraeli said: "It became her lot to break to her son, quite a youth, the death of his sister, to whom he was devotedly attached. The boy was so overcome with misery that the agitated mother to console him clasped him in her arms and thus received the kiss of death." It was a burden that Ernie bore for the rest of his life. Queen Victoria took charge of her Hessian grandchildren, pampering and protecting Ernie, as she never did with any of her own children. She supervised their educations and upbringing, thus freeing their father for his duties as reigning Grand Duke. The children spent many holidays in Britain with their grandmother, especially when they were very young, and at their father's new hunting lodge, Wolfsgarten, outside Darmstadt. The 1880s saw the marriages of Ernie's two eldest sisters, Victoria to Prince Louis of Battenberg, the future Marquess of Milford Haven, and Elizabeth to Grand Duke Serge Alexandrovich, son of Emperor Alexander II and Empress Maria Alexandrovna, herself a Hessian princess. Ernst Ludwig was growing to be a curious, contradictory young man, about whom much has been written, and even more speculated. As Marlene Eilers writes, he was almost preternaturally sensitive, and "never recovered from the shock of losing his mother at the age of ten; spoiled and pampered by his parents and sisters, his character had no chance to develop other than in an atmosphere dominated by feminine influence." Ernie had no interest in a military career; on the contrary, he pursued his education at the University of Leipzig, where he insisted on following his egalitarian instincts in attending classes with ordinary students, rather than joining the Aristocratic Corps. At Leipzig, Ernie excelled at his studies of literature, history, and art-it was here that he was first exposed to the Arts and Crafts Movement-but he also devoted equal time to his enthusiasm for the university's social life. Not unusually, his studies suffered, and Queen Victoria despaired. Following two years at Leipzig, Ernie attended classes at the University of Giessen in Hesse. This proved less successful; the classes focused on political issues, for which he had little interest. Where at Leipzig he had eagerly mingled with ordinary students, at Giessen he stood apart from his classmates, treated with great deference as a Hessian Prince. His early egalitarian leanings were quickly forgotten in this atmosphere, and he became more conscious than ever of his own future position. These expectations caught up with him when, in the spring of 1891, Ernie was required to serve a period of time in the Prussian Army. With great reluctance, he left Hesse for Potsdam, where he joined a regiment of Prussian Dragoons. His time at Potsdam proved an ordeal: Ernie hated the stifling military atmosphere, the brooding Prussians, and the fact that his subordinate position within the Empire was constantly reinforced. In early 1892, Ernie's father died and he succeeded him as Grand Duke. From the very start, his promised to be a reign far different to that of his father. "He had no use for lugubrious faces, stiff manners, and hushed voices," recalled Meriel Buchanan, daughter of the British Ambassador, who knew him well. "He wanted movement, color and gaiety all about him, his rapid speech, his quick gestures, his bright blue eyes, which could on occasion be clouded with melancholy, all expressed his mercurial temperament. " He brought all his considerable energy to the Grand Ducal Throne. Once the period of official mourning for his father had ended, he cast aside the blackness of the past, filling the rooms of his palaces with music and laughter. With his sister Alix acting as hostess, he planned elaborate masquerade balls; invited the most famous singers, composers, and actors of the day to perform in the Court Theatre; and again brought gaiety into the lives of the people of Darmstadt. The only thing missing from the Grand Duke's life was a consort to share his Throne. Ernie himself seemed completely oblivious to the aristocratic women at the Hessian Court, who took great pains to attract his romantic attention. It was Queen Victoria who took the matter in hand. An inveterate matchmaker, the elderly Queen began to focus her energies on her young grandson, and Ernie soon fell victim to an intricate plot to marry him off to Princess Victoria Melita, daughter of Prince Alfred, the Duke of Coburg, and his Russian wife, Marie Alexandrovna, only daughter of Emperor Alexander II. In October 1891, many members of Queen Victoria's extended family arrived at Balmoral for an autumn vacation. The Queen watched as Ernie and Victoria Melita-called Ducky in the family-seemed to thrive on each other's company. The spark ignited between the cousins that October was nothing more than friendship; however, the Queen and the Duke of Edinburgh nurtured and encouraged it, hopeful that it was the beginning of a deeper attachment. Ernie had no real desire to marry, and he prevaricated at Victoria's strong suggestions that he pay serious court to Ducky. Eventually, Victoria wrote to Ernie's eldest sister, ordering her to have Ernie make haste to England to ask for Ducky's hand in marriage; she was sure, the Queen wrote, that Ernie did not want to miss the chance for this excellent marriage. But the Queen was much mistaken; the homosexual Ernie most definitely did not wish for this marriage. He was also beginning to enjoy his reign as Grand Duke, indulging himself in the newfound freedom of his position. He did not want to curtail his first taste of independence for an undesirable marriage. In the roundabout way that was the only manner of communicating these issues to his grandmother, Ernie wrote to his sister Victoria that he was "uneasy about being an inadequate husband." The Princess, championed by her aunt, Victoria's eldest daughter, the Empress Frederick of Germany, approached the Queen on the grounds of consanguinity and the looming problem of hemophilia in the family. But Victoria bullied and intimidated Ernie into traveling to CoburgÐwhere Ducky lived with her parentsÐand extending a proposal to the equally resigned bride-to-be. The wedding took place in Coburg on April 19, 1894, but the bride and groom were nearly forgotten in the romantic drama that played out in the little German town, as Tsesarevich Nicholas pursued and eventually won the hand of Ernie's sister Alix. It was not an auspicious start to Ernie and Ducky's marriage, though at first they both tried to make an uncomfortable situation work. Ernie was an attentive husband, and Ducky ornamented the social life of his capital in exemplary fashion. But they were both very young, and soon returned to their individual pursuits. Seventeen-year-old Ducky was happier riding her black horse, Bogdan, around the countryside than she was in fulfilling the expected charitable and administrative duties of the Landesmutter. Ernie, deeply involved in the development of the Arts in Hesse, began to resent Ducky's selfishness. The marriage was successful in one way: Ducky quickly became pregnant and on March 11, 1895, gave birth to a daughter, whom Ernie named Elisabeth in open defiance of Queen Victoria, who had requested that she be called Alice. Ducky had little maternal instinct, but Ernie positively doted on his new daughter, spending most of his spare time playing with her, bathing her, and taking her for strolls in the garden of the Neues Palais. The more time he spent with Elisabeth, the less time he appeared to have for his wife, and the little Princess soon became an unwitting wedge who tragically would only drive the couple further apart. Within two years, the Hessian marriage was all but over, and Ernie and Ducky lived separate lives, filled with mutual bitterness and loathing. Ernie could not understand his mercurial young wife, nor abandon his own inclinations, while the willful Ducky possessed an intensely stubborn streak. Ernie returned to his artistic endeavors, and to his little daughter, whose love was unconditional; and Ducky began to spend as much time as possible away from Darmstadt. 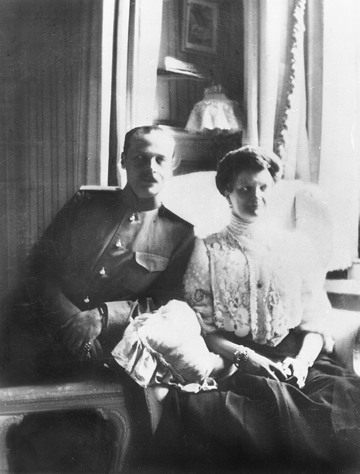 It was during one such holiday that she rekindled an old romance with her Russian cousin, Grand Duke Kirill Vladimirovich, who would eventually become her second husband. In 1901, an escape route presented itself when Queen Victoria died. Within a month of the funeral, Ducky left Darmstadt, ostensibly on holiday; when she returned, it was only for a few days. Although she told Ernie that she was going to visit her mother in Coburg, neither the Grand Duke, nor the servants who packed more than a dozen steamer trunks filled with her possessions from Wolfsgarten and the Neues Palais, were under any illusions that she had any intention of returning. From Coburg, she informed Ernie that she intended to seek a divorce. He himself might have been content, no matter how unhappy the situation, to carry on with the marriage, for both the sake of his own reputation and for his beloved daughter. Ducky, however, was not to be dissuaded. News of the Hessian divorce scandalized the Courts of Europe. It was unheard of for a sovereign to terminate his marriage legally. As their relatives seethed with gossip over the scandalous event (Emperor Nicholas II and his mother both agreed, "the loss of someone near is preferable to the public disgrace of a divorce"), a Hessian court dissolved the marriage in December 1901. Elisabeth was left at Darmstadt, without her mother, but with her loving father, who now had nothing but time to spend with her. They played endless games in the grounds of Wolfsgarten; one day in early 1902, Elisabeth told Ernie that she had dreamed of a small house of her own, hidden deep in the woods. During a visit to her mother in Coburg, Ernie brought her dream to life, building a perfect, miniature house, just had she described, with white walls and a steeply pitched roof, a chimney looped to look like a needle, and glass witch balls in the garden to keep the little girl safe. Above the door was an inscription: "This little house was built just for me in the year 1902." In autumn, 1903, following the wedding in Darmstadt of Princess Alice of Battenberg and Prince Andrew of Greece, Ernie and Elisabeth traveled to Poland for a long visit with their Russian relatives at Imperial hunting lodge of Skernevetski. The adults spent their days hunting and their nights at the theater; for Elisabeth and the four young Grand Duchesses, there were swings, a "giant's stride, " and rides in a small carriage pulled by a pair of tame deer. The Princess and her cousins went giggling to bed late in the evening of November 15, following an eighth birthday party for Grand Duchess Olga Nikolaievna. The next morning, when Elisabeth complained of a sore throat, the Russian court doctor put it down to too much excitement. By evening, she seemed sufficiently recovered, and her father joined Nicholas and Alexandra at a theatrical performance as planned. In their absence, the Court Doctor, unable to shake his feelings of unease, summoned a specialist from Warsaw, who arrived shortly after the Imperial adults returned from their night out. When they came in to see her, Elisabeth seemed in good spirits, but suddenly, she lapsed into unconsciousness. Injections of caffeine and camphor revived her, but she was in agony, with sharp pains in her chest and had difficult breathing. By early morning, the doctor was certain she had a virulent form of suppressed typhoid, although rumors also flew around the hunting lodge that she had eaten from poisoned dish intended for the Emperor. "I think I'm dying," Elisabeth whispered to her aunt Empress Alexandra in a brief moment of quiet. "Send a telegram to Mama. "When Alexandra promised to do so in the morning, the little girl said, "No, immediately please." With some reluctance, the Empress dispatched a cable to her former sister-in-law. The telegram found Ducky at breakfast; within minutes, she was on her way, taking only her coat as she drove to the railway station in Coburg. Before she could leave, however, a second telegram arrived, with the tragic news that Princess Elisabeth had died at 7 A.M., just after asking to see her beloved Anastasia. In their final act together as parents, Ernie and Ducky placed their daughter's body in a small silver casket for the long journey home to Darmstadt. More than thirty years later, the still heart-broken father declared that the hours on the funeral train were seared into his memory. "My dearest Elisabeth, " he said, "Was my only sunshine." Elisabeth was buried in the Rosenhohe, in a ceremony planned by her father. Her grave can still be visited today, halfway along a quiet wooded path, guarded by a perfect Art Nouveau angel, and within sight of Ernie's own resting place. Slowly, Ernie began to regain his spirits as spring of 1904 came to Darmstadt. He spent his lonely days creating and cultivating his artist's colony in Hesse. In the first five years of the new century, he had founded the Darmstadt Kunstlerkolonie at the Mathildenhohe, a park near the Rosenhohe. Here, clusters of houses surrounded a terraced hillside dominated by the Ernst Ludwig Exhibition Hall and Studio, and the Russian Orthodox Church of St. Mary Magdalene built by Nicholas II. Through his devoted patronage, Darmstadt became the German capital of the Jugendstil movement. Important architects, sculptors, artists, and craftsmen flocked to the city, which enjoyed a reputation of enlightened freedom under his rule. In 1904, Ernie met the woman who was to become his second wife, and provide Hesse with a true Grand Duchess: Princess Eleonore of Solms-Hohensolms-Lich. He found in the Princess-called Onor in the family-valuable emotional support, in the wake of the void left by his Elisabeth's death. They developed a deep understanding of each other, and Eleonore, in contrast to Ducky, appreciated the Grand Duke's artistic temperament. At thirty-three, Eleonore was beyond the age of contracting a conventional marriage to some suitable royal husband. Perhaps the pair engaged in frank discussions, and came to an agreement; other royal marriages had often been built on such foundations, where each partner acted as friend and confidant to the other, and undoubtedly the friendship between this pair grew into love. This is unlikely to have been any passionate, romantic alliance, but rather the drawing together of two persons who recognized in each other qualities that would form a successful partnership based on friendship, honesty and concern. There were also dynastic concerns for the Grand Duke. As an only son, he himself was without an heir, and he desperately needed to re-marry and have more children to secure the Hessian Throne. Ernst Ludwig and Eleonore were married in the Court Chapel of the Old Schloss in Darmstadt on February 2, 1905. Together, the pair had two children: Georg Donatus, born in 1906, and a second son, Prince Ludwig, born in 1908. Undoubtedly the success of their marriage rested largely on Eleonore's understanding and acceptance of her husband's character. In Eleonore, he found a woman secure in the knowledge that she was truly loved and admired and who, unlike the temperamental Ducky, was content to dutifully fulfill her role as Grand Duchess of Hesse. Unfortunately, as successful as Eleonore was as Landesmutter, she did not have many years before the traditional Hessian way of life was submerged in the First World War. Ernie, as the Grand Duke of Hesse, was called away to serve at Kaiser Wilhelm's Headquarters. In his absence, Eleonore looked after their sons, and organized hospitals and relief services. The war years were undoubtedly hard on both of them, but the end of the war, and the abdication of the German Emperor was infinitely harder. In the wake of the Kaiser's exile, all the ruling German princes and grand dukes were swept from their thrones, Ernie among them. He was deeply loved by his people, but this could not save him from the ignominy of deposition during the Revolutions of 1918. Worse news was to come from Russia, where both of his sisters, and his Imperial brother-in-law, nieces and nephew, were murdered in the wake of Nicholas II's abdication. In the grip of crushing tragedy, perhaps material possessions did not mean much to the Grand Duke, but in the end, his years of sterling service to his country were enough to ensure that he would be able to stay in Darmstadt, unlike several of his princely cousins, who were exiled from their countries, losing everything. He was allowed to keep the Neues Palais in Darmstadt, and the hunting lodges at Seeheim and Wolfsgarten, as his personal property. The Neues Palais was eventually sold after the Grand Duke's death in 1937, and bombed by the RAF in 1944. Seeheim was sold as well, leaving the family with Schloss Wolfsgarten; it remains the seat of the present head of the House, Prince Moritz, Landgrave of Hesse. Throughout the 1920s, Ernie and his family enjoyed considerable popularity in Darmstadt. In February 1931, the Grand Duke's eldest son, Prince Georg Donatus, married Princess Cecilie, daughter of Prince and Princess Andrew of Greece, sister of Prince Philip, Duke of Edinburgh. The couple quickly had three children: Ludwig, Alexander, and Johanna, and it seemed that Ernie's life would drift tranquilly towards its close, surrounded by his family and his beloved art. In the end, however, there was an echo of Ernie's childhood desire not to die alone. Ernie died peacefully in Wolfsgarten on October 9, 1937, and was laid to rest in the Rosenhhe a short distance from the grave of his beloved Elisabeth, screened from her only by the boughs of a weeping willow. Ernie's youngest son, Ludwig, had been planning to marry that October, but he postponed his wedding until November. On November 16, Ernie's widow Eleonore, together with Georg Donatus, his pregnant wife, and their two sons, traveled to London to attend Ludwig's wedding. Their plane never arrived at its destination; flying in a terrible fog, it crashed into a factory smokestack near Ostend in Belgium. There were no survivors. At the insistence of Ernie's sister Victoria, the Marchioness of Milford Haven, Prince Ludwig proceeded with his wedding, though it was a somber affair. He returned to Darmstadt with his new wife Margaret, and the bodies of his family, who were buried in a row next to Ernie in the Rosenhhe. Ludwig and Margaret adopted the sole remaining Hessian child, Johanna, who died in 1939 of meningitis. Three decades later, in 1968, Prince Ludwig died without issue; he was the last descendant of Grand Duke Ernst Ludwig of Hesse. Today, Ernst Ludwig is perhaps best known as brother to the last Empress of Russia, a man who spent his days with a host of remarkable relatives, from Queen Victoria and Kaiser Wilhelm II to his brother-in-law Nicholas II. Yet during his life, he single-handedly sponsored and promoted some of the most important architects, artists, sculptors, and designers of the 20th Century. His artists' colony, and his love of art nouveau-not only enriched his capital but influenced taste and opinion across the world. His support of these men, who would later train such luminaries as Le Corbusier and Mies van der Rohe, dramatically changed the face of modern art and architecture. He ruled his country with enlightenment and moderation, ensuring his place in the affections of his subjects in the difficult years following the First World War. In Darmstadt, Ernst Ludwig remains a beloved figure, perhaps forgotten by the rest of the world, but appreciated by those surrounded by his visionary works. Penny Wilson is the co-author, with Greg King, of "The Fate of the Romanovs " (Wiley, 2003), and is Editor-in-Chief of Atlantis Magazine: In The Courts of Memory. She and Greg are now working on a second book together, the first English language biography of Grand Duke Ernst Ludwig of Hesse.